This toner refreshes and cleanses your skin pore-deep. Provitamin B5 and hyaluronic acid provide your skin with ideal “pre-care” and prepare it for the following SkinIdent skincare product. 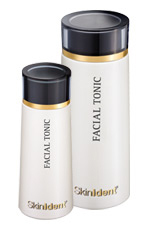 FACIAL TONIC is the perfect supplement to the SkinIdent CLEANSING MILK.Please always use the two products together so that your skin can benefit from the synergistic effect of both products. Also available in travel size.